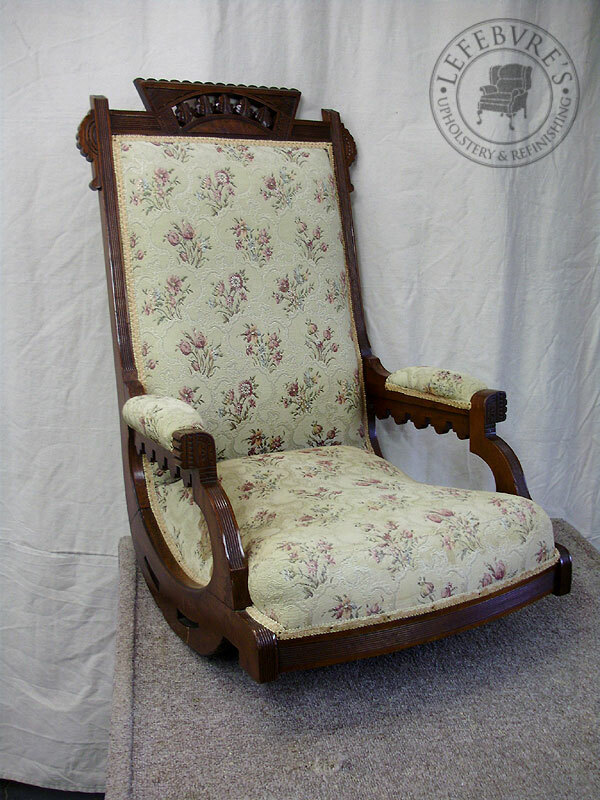 Here is a simple arm chair. 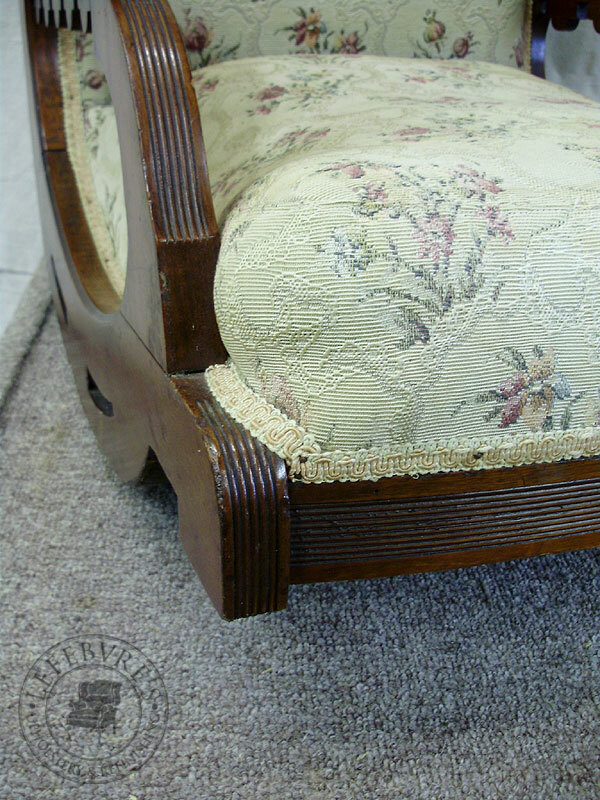 It was still in perfect shape, with a nice fabric, but the owner wanted a change. 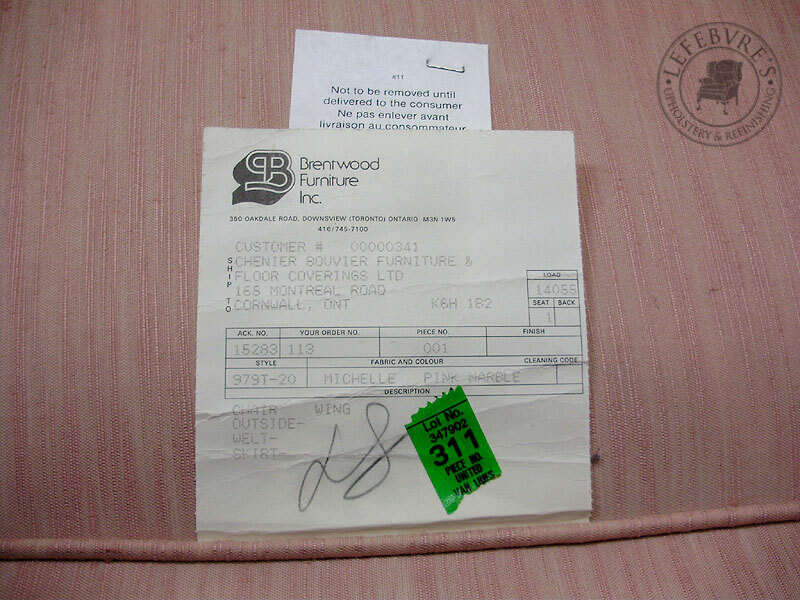 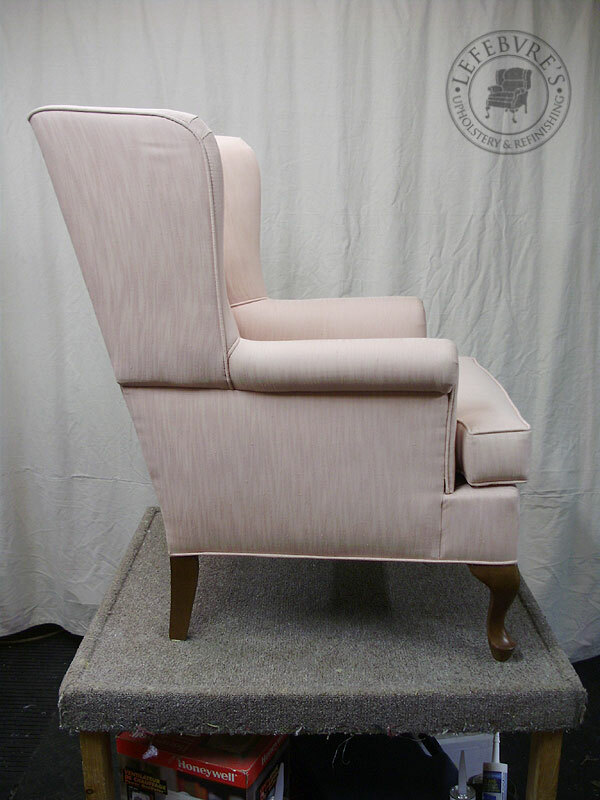 Here are a pair of Brentwood Furniture wing chairs. 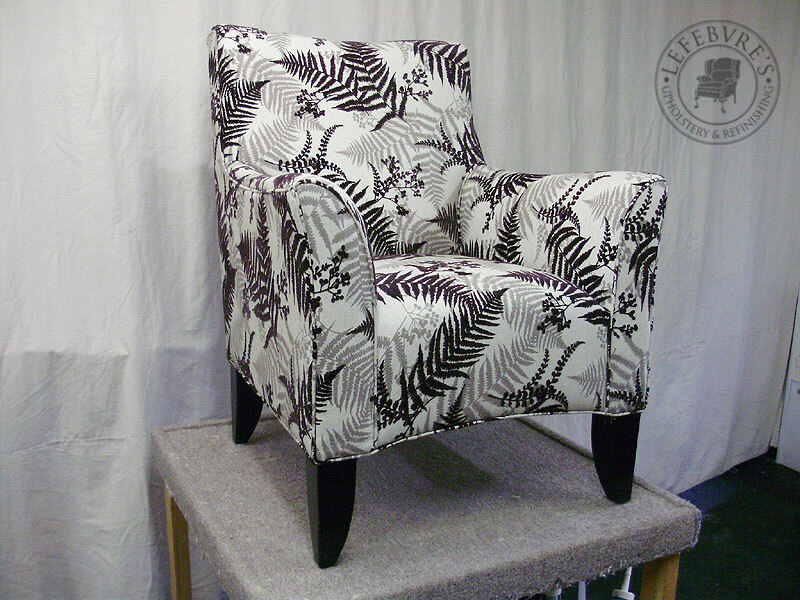 These are 2 of 4 chairs done in the same fabric for the same client. 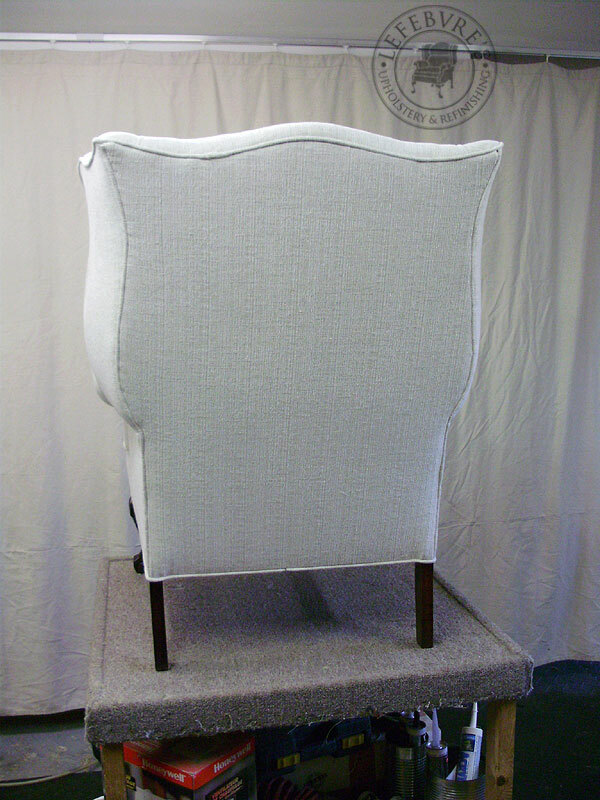 Here are a pair of Brunetti Furniture wing chairs. 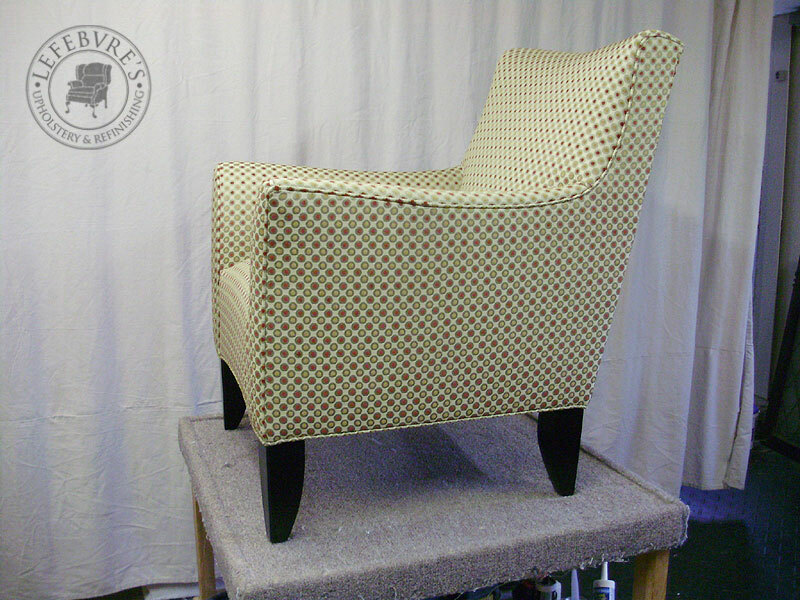 These are 2 of 4 chairs done in the same fabric for the same client. 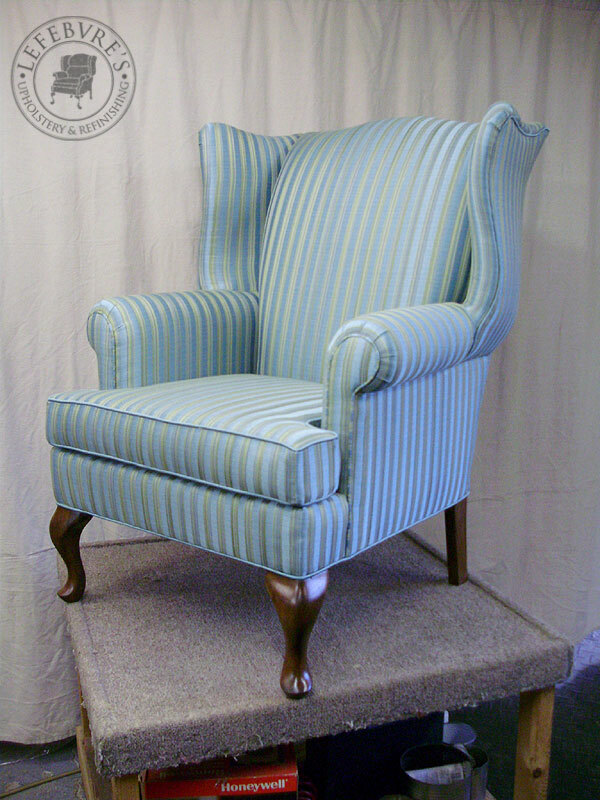 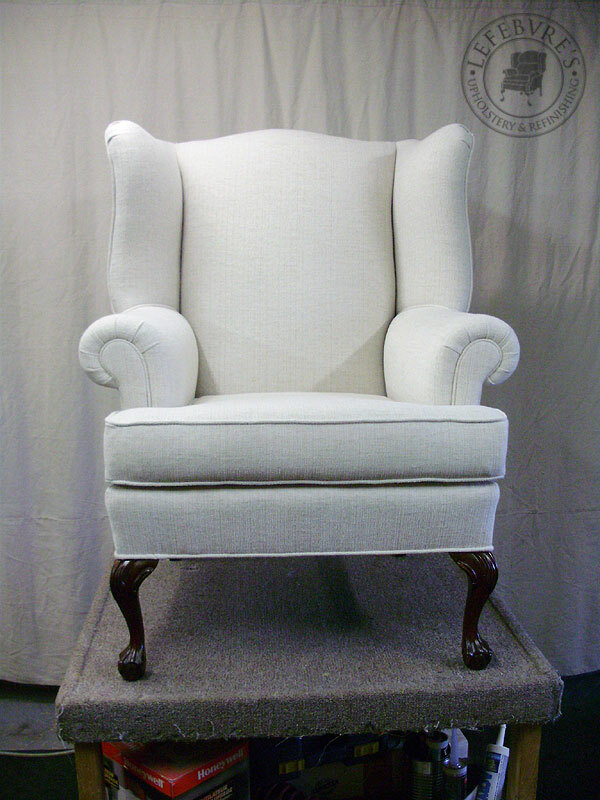 Here is another wing chair. 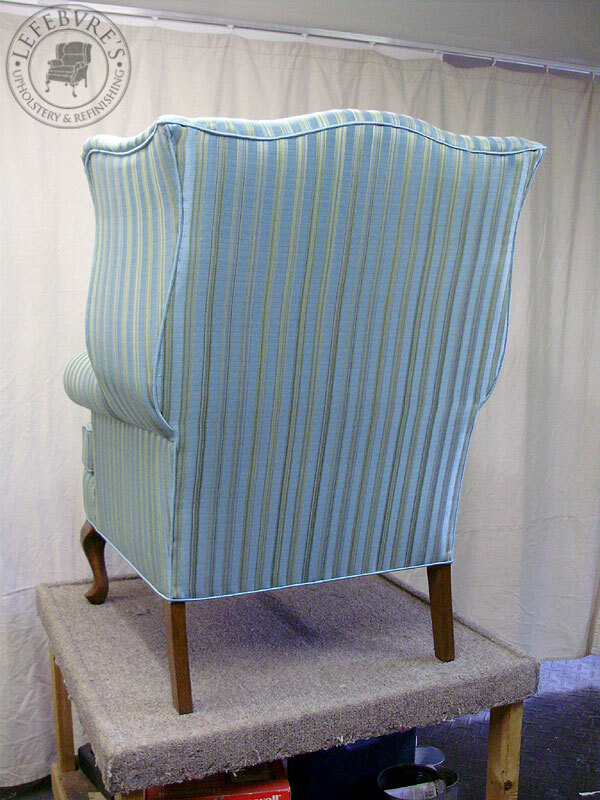 This one was done in a lovely and fun light blue, with a bit of shine to it. 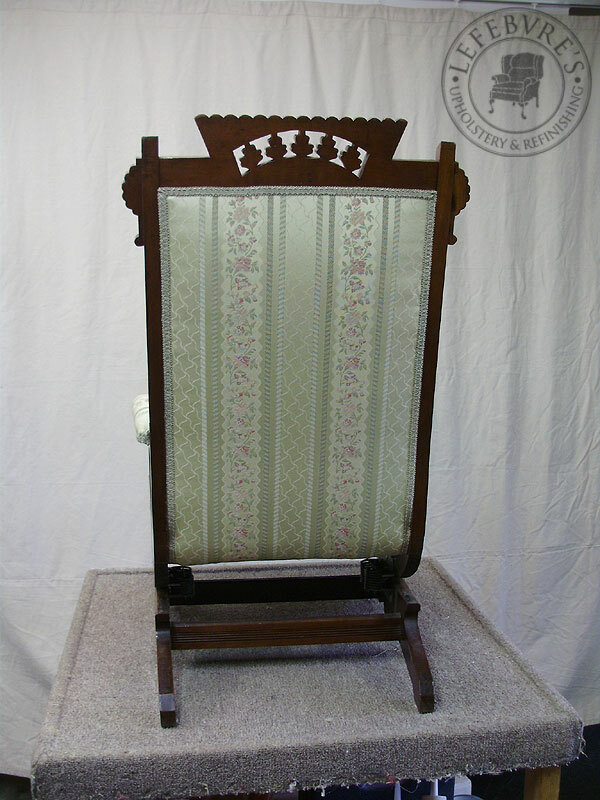 Sorry, I have no before photos for this one. 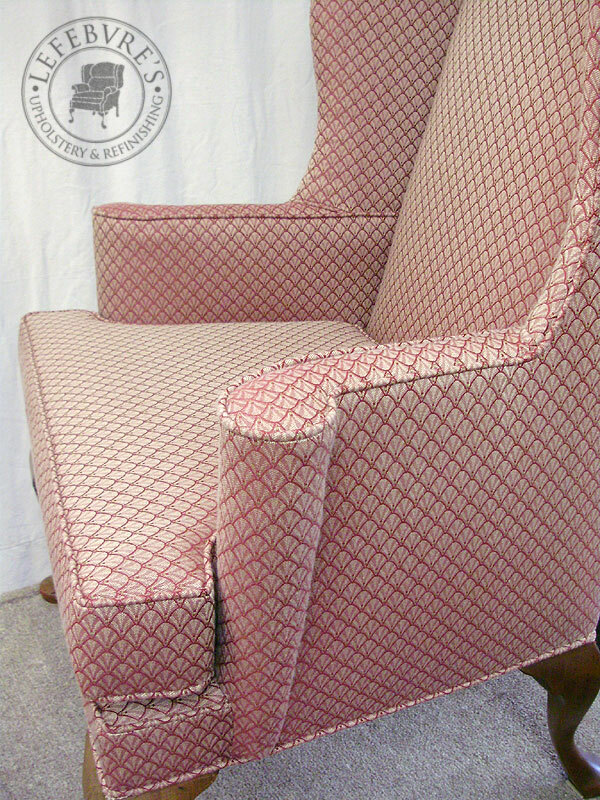 If I find them, I'll add them. 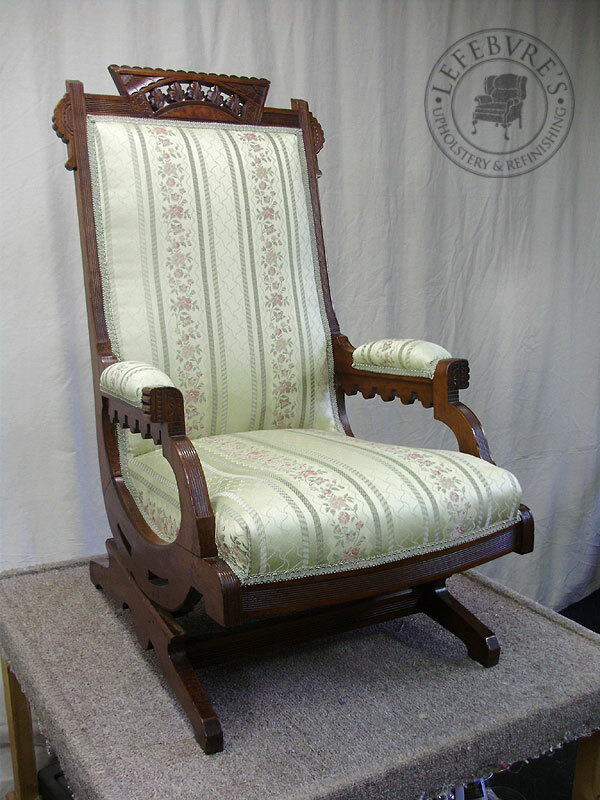 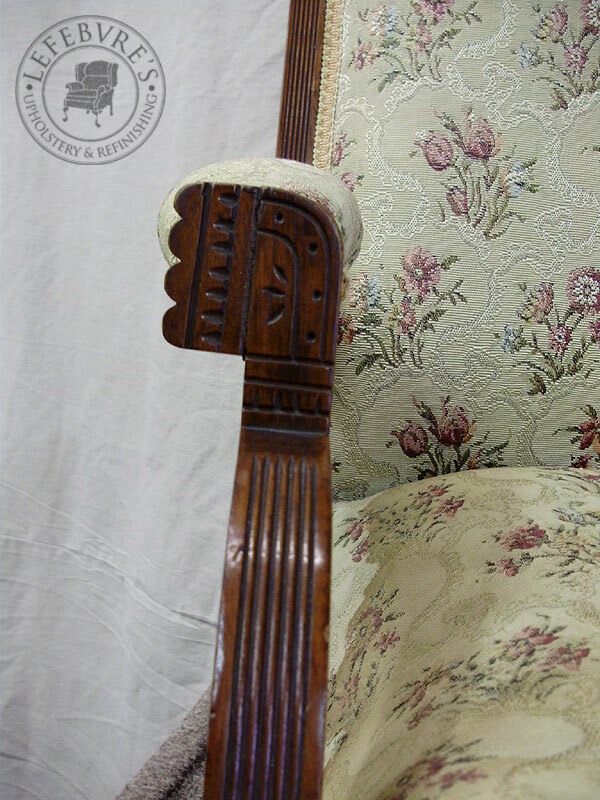 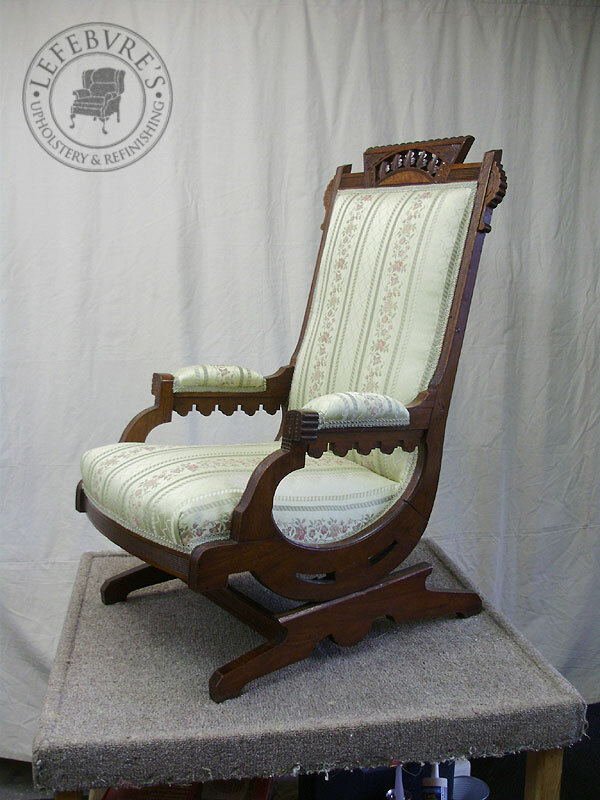 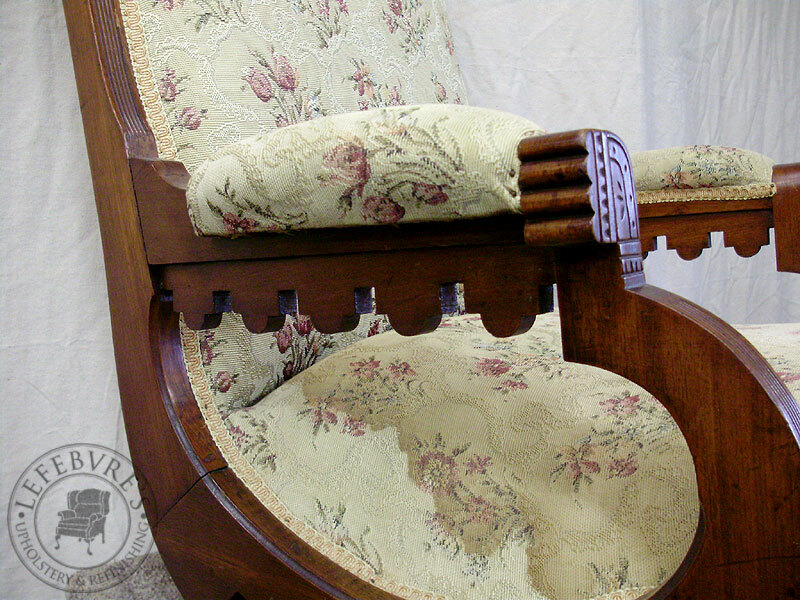 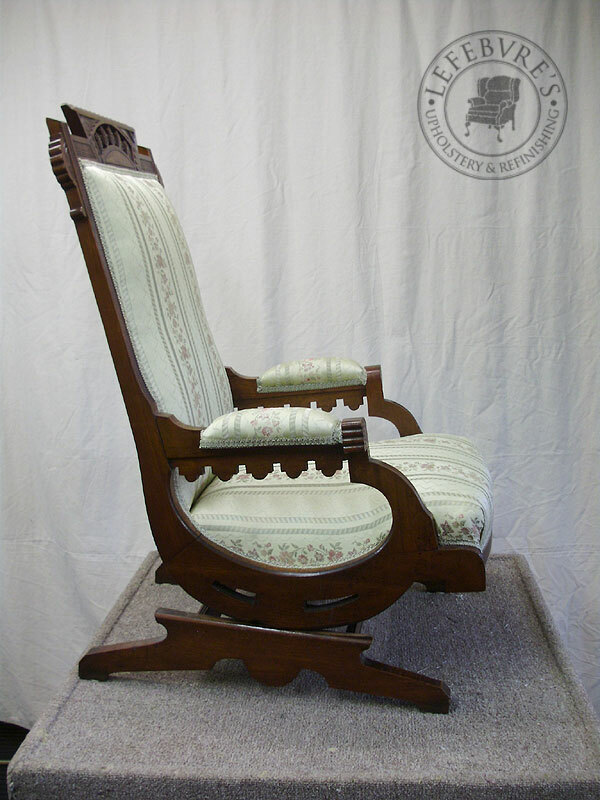 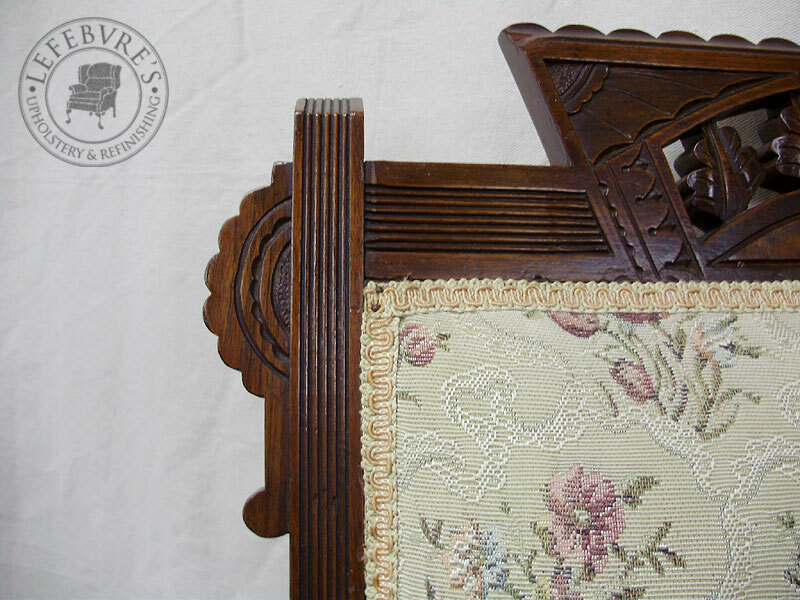 This was a beautiful antique walnut rocking chair, done in the Eastlake style, but with some Victorian details. 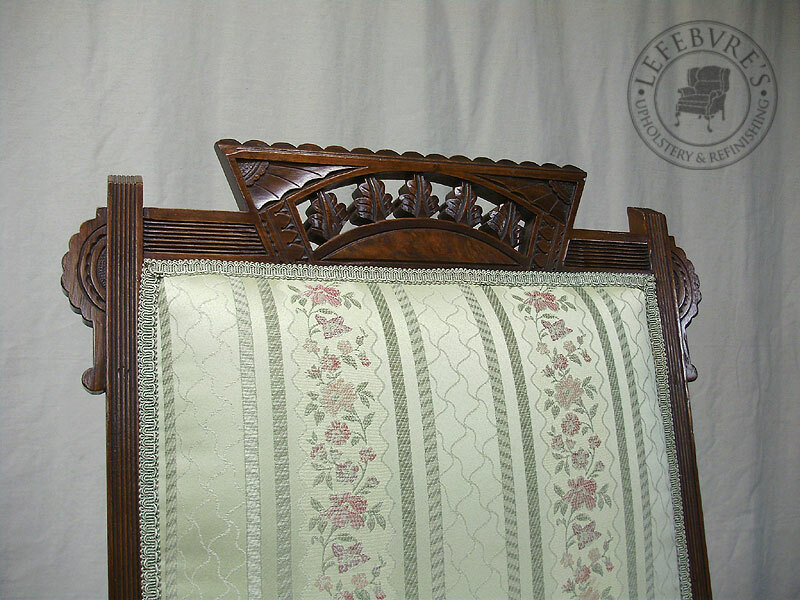 I especially like the fine reeded rails. 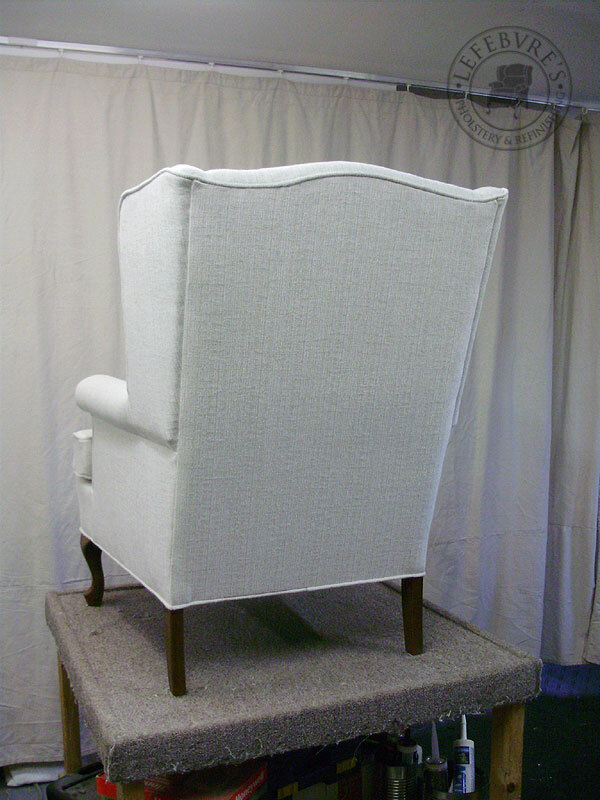 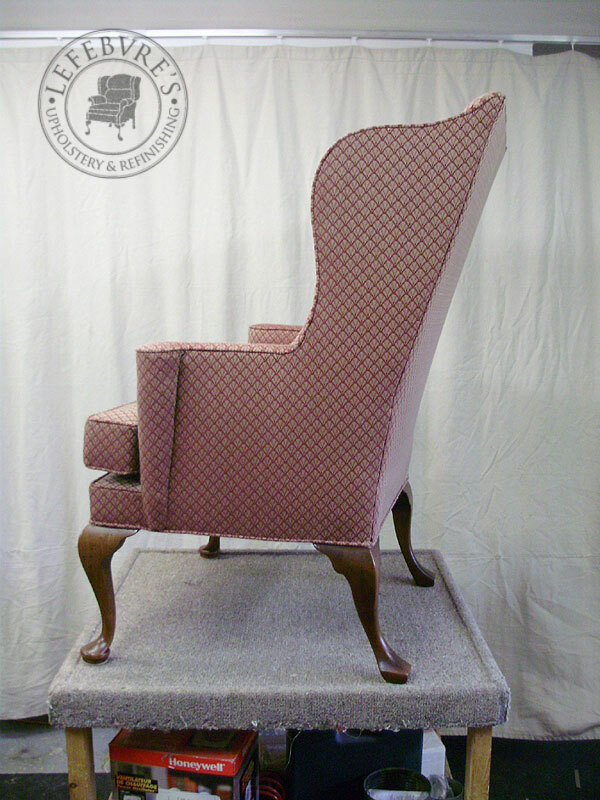 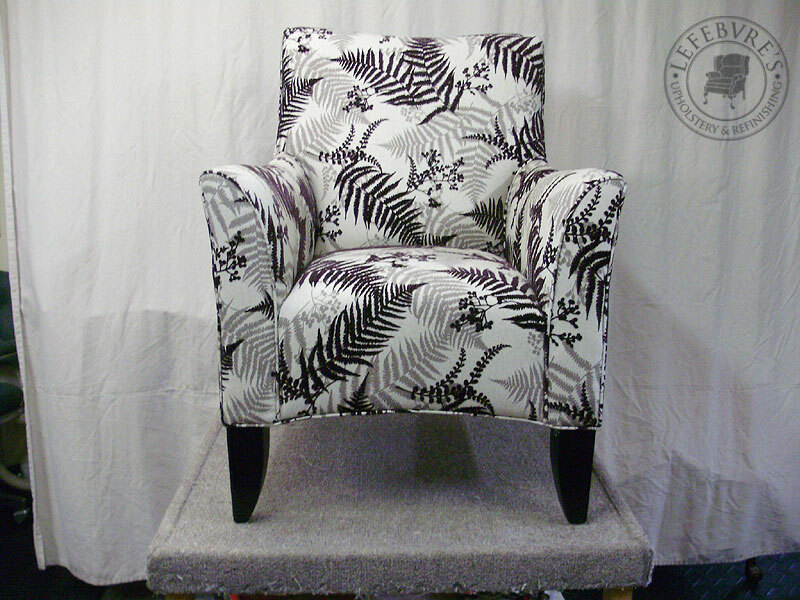 The fabric on the chair was worn, and the seat was starting to come apart, but the client wanted to keep the chair looking as close as possible to the same as what she had. 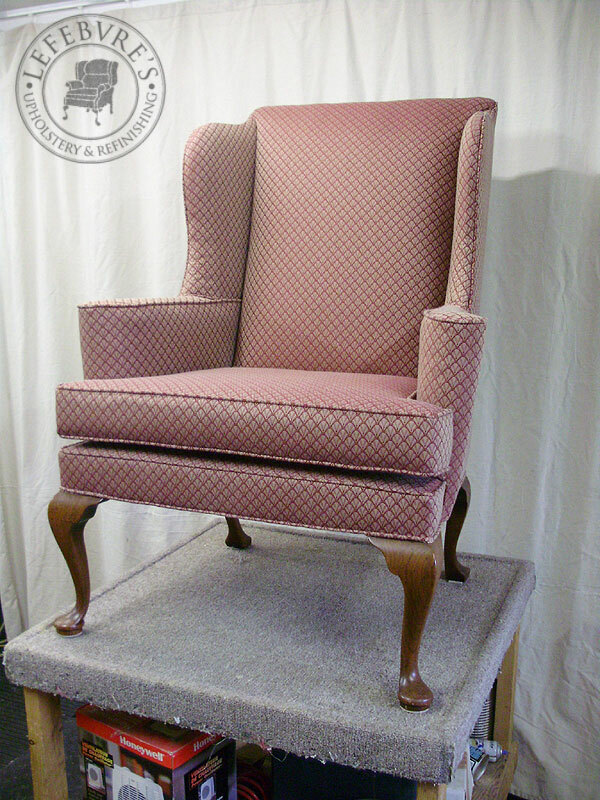 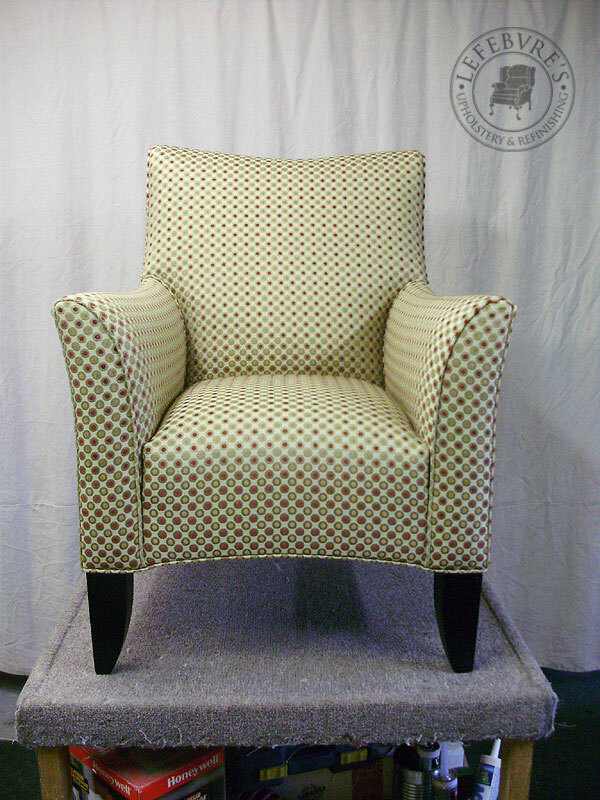 I think we were able to find a very good match to her old fabric, and the finished chair looks great. 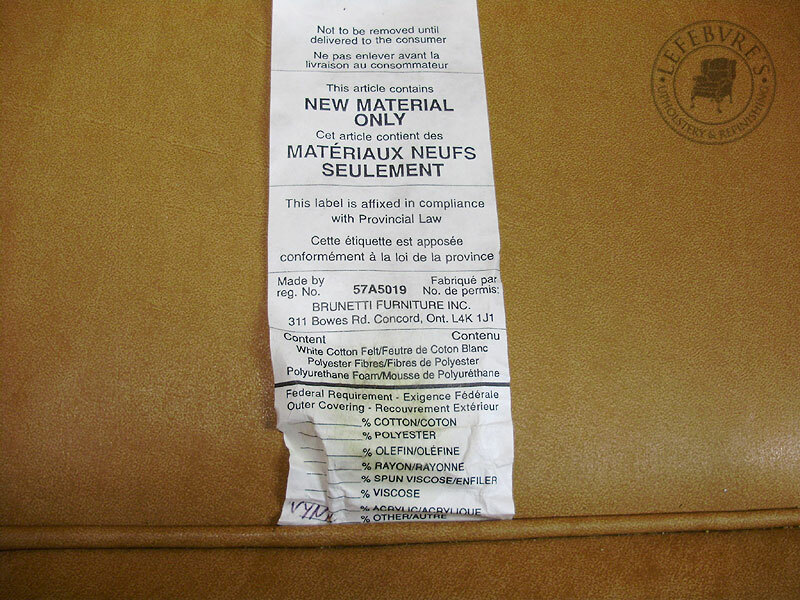 The general style and quality seemed to say "Made in Europe" but the above photo confirmed this quite clearly. 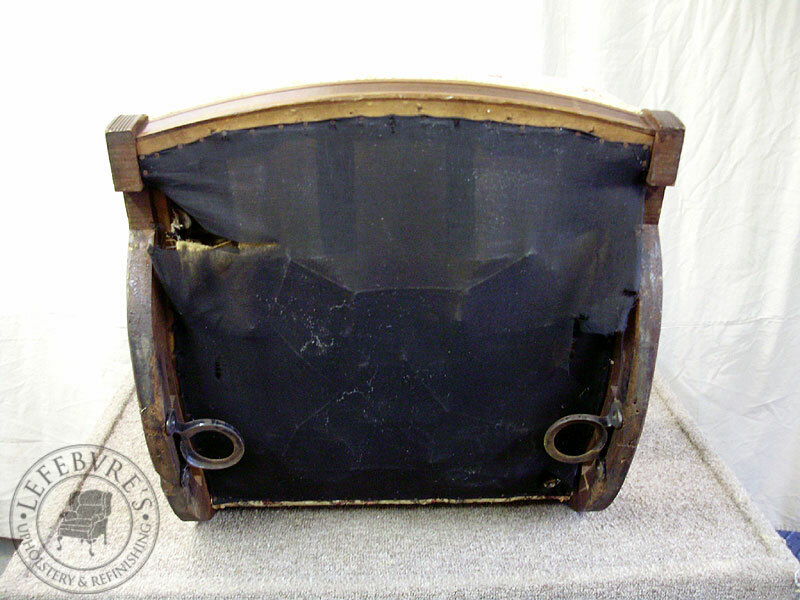 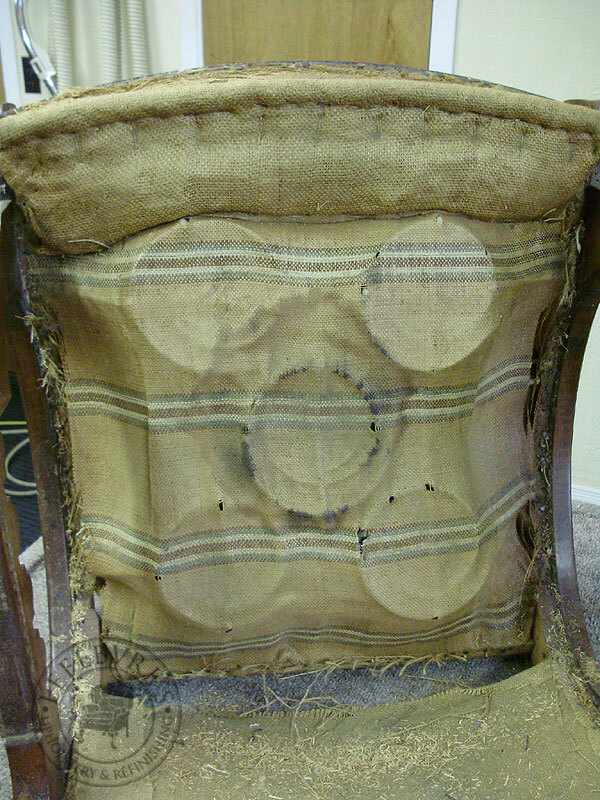 The seat had been "repaired" or reinforced with an additional layer of later burlap. 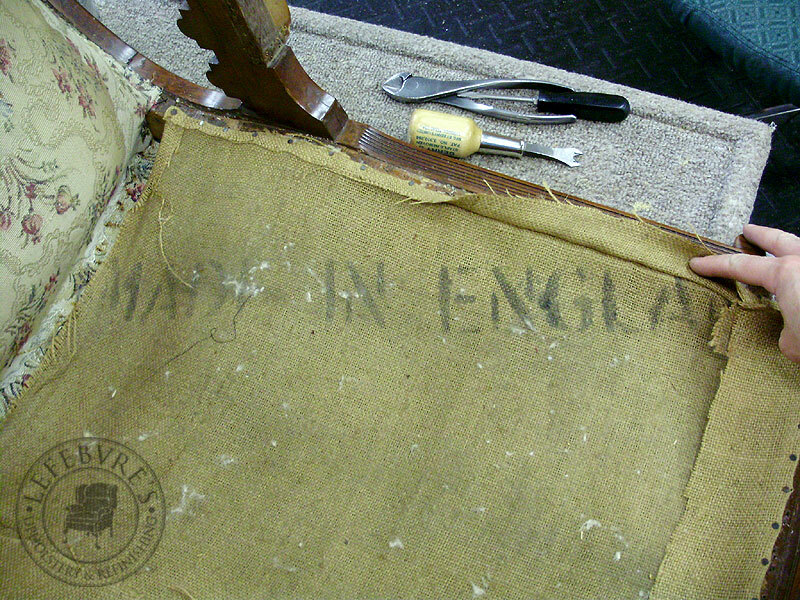 Under this was the original edge roll, and the original (wonderfully striped) burlap. 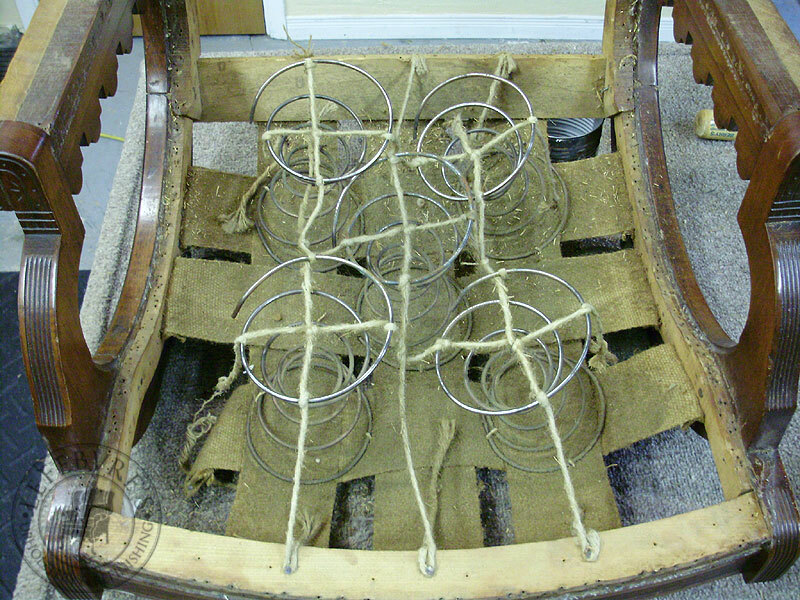 Springs and the very tired/stretched webbing. 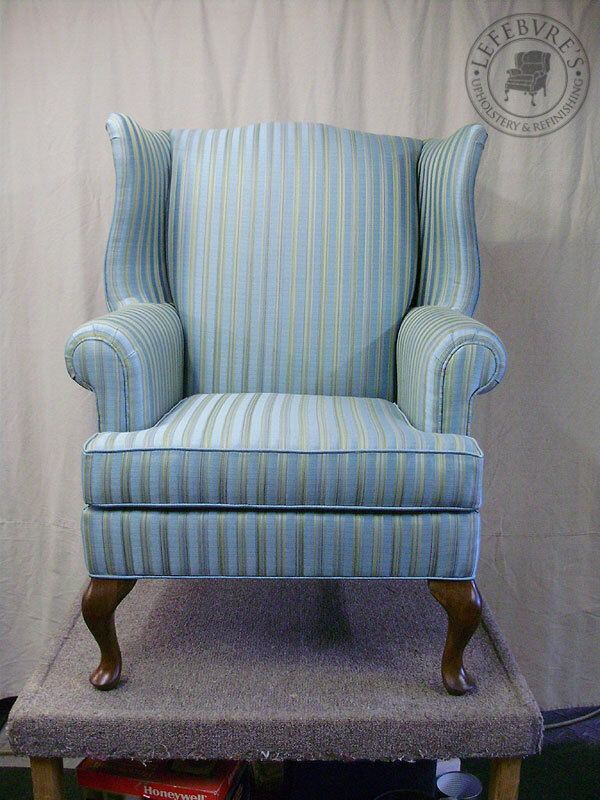 And the finished chair. 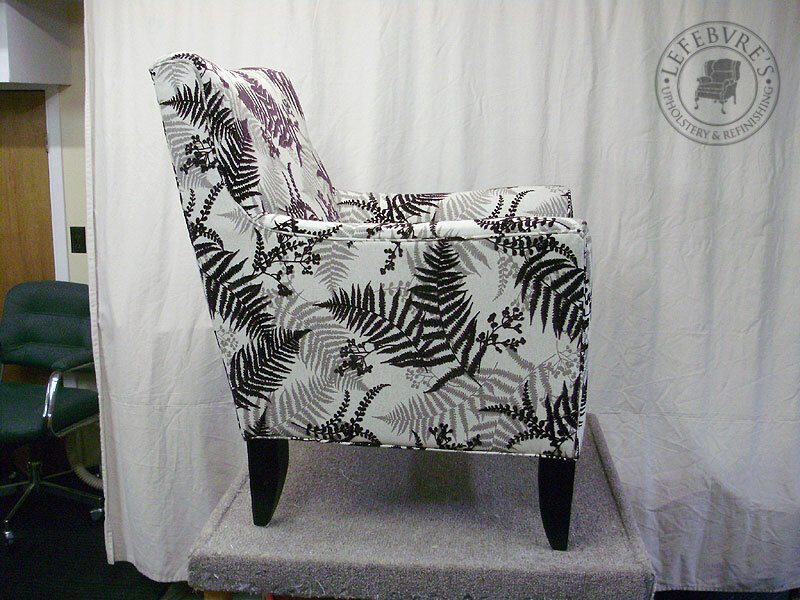 The fabric isn't the same as the original, but it's the same colours, with similar florals. 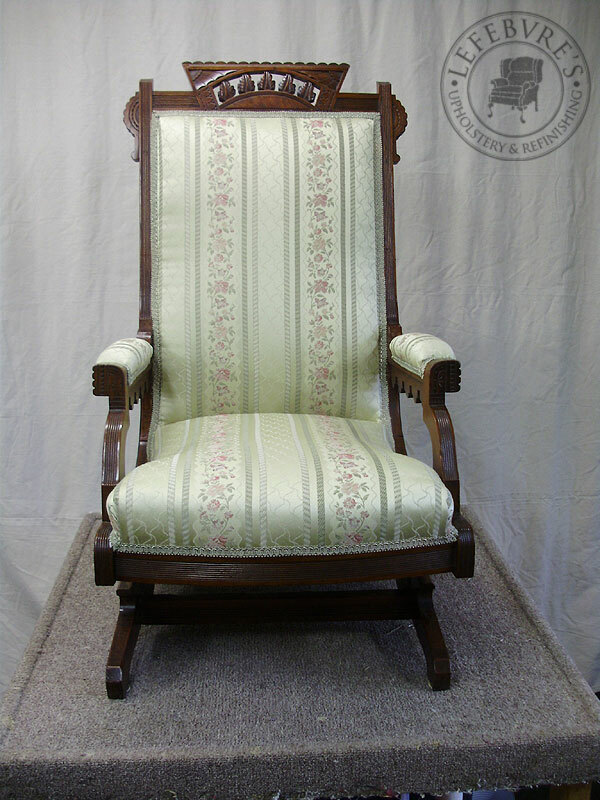 This was quite a beautiful and exceptionally well made chair. 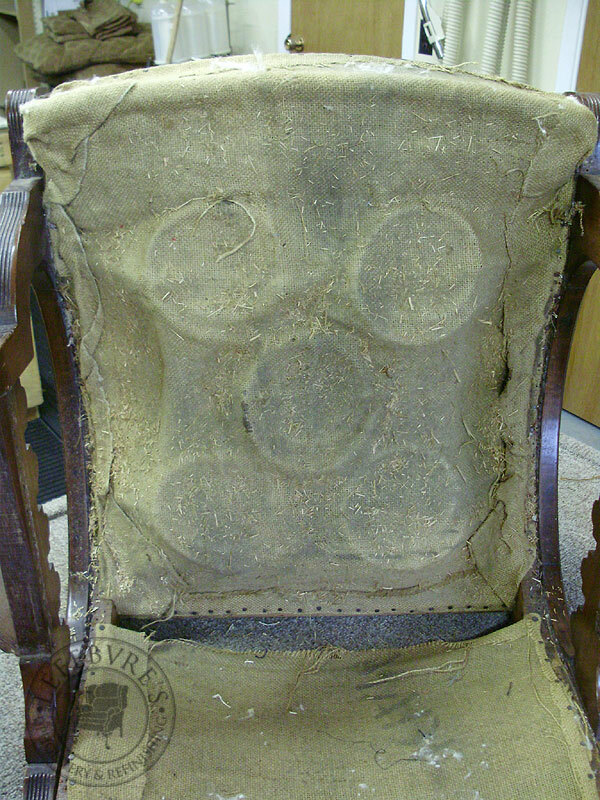 It's not terribly old (maybe 30 years old? 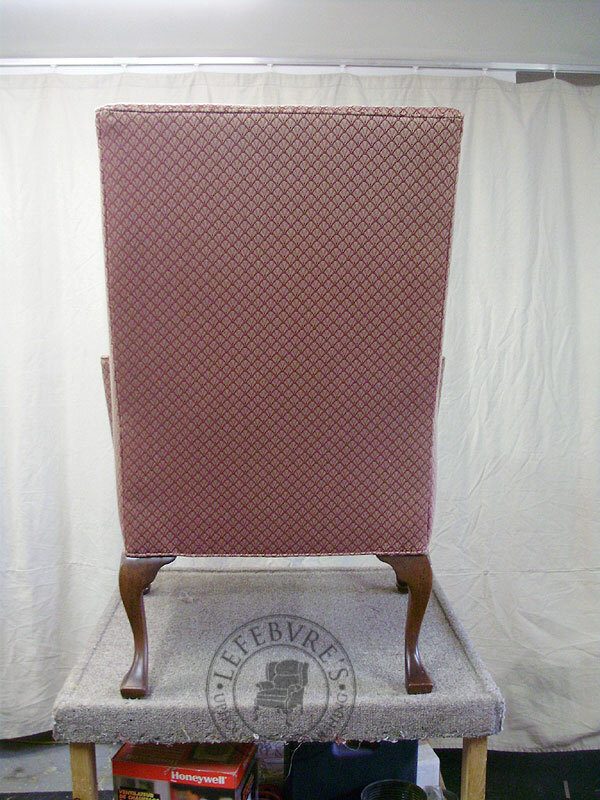 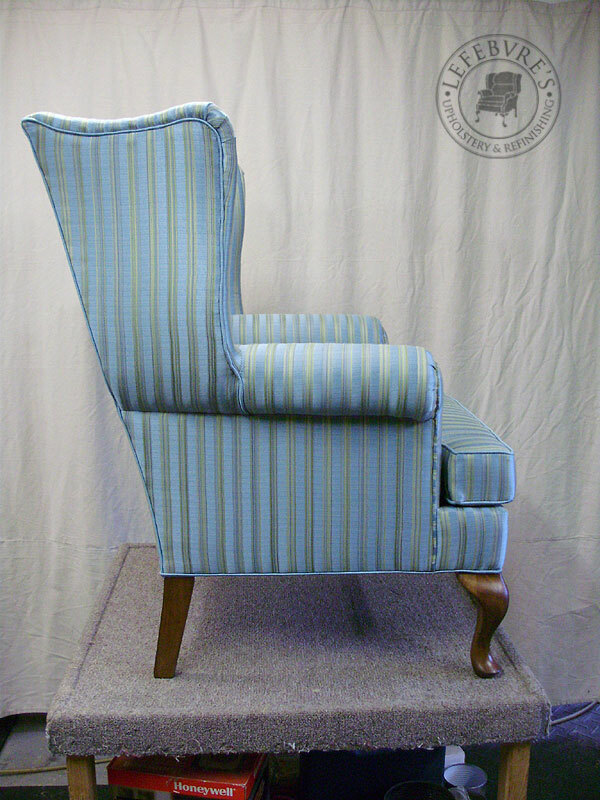 ), but it's made in the style of old wing chairs from the late 1700s, and early 1800s. 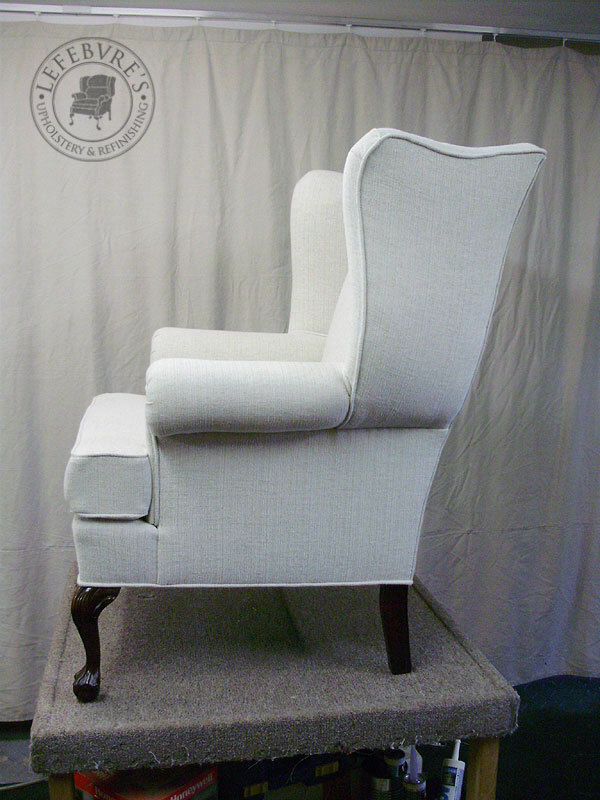 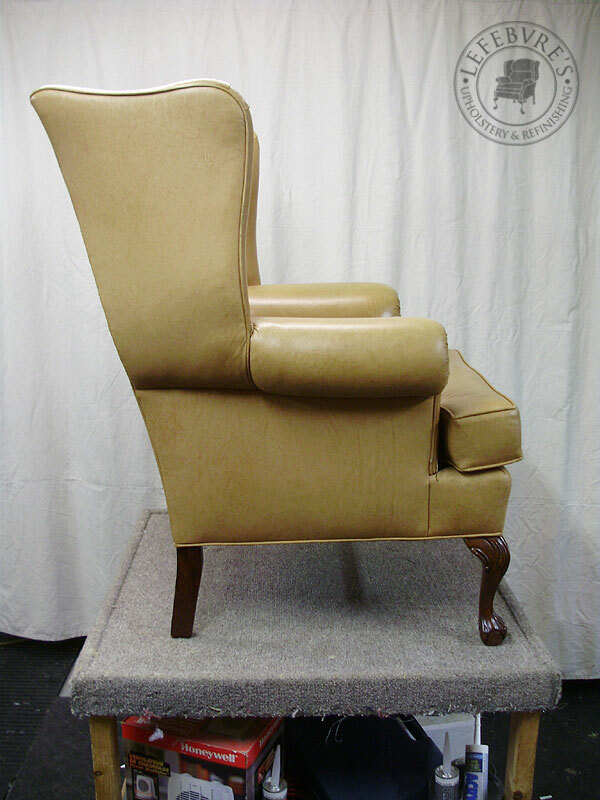 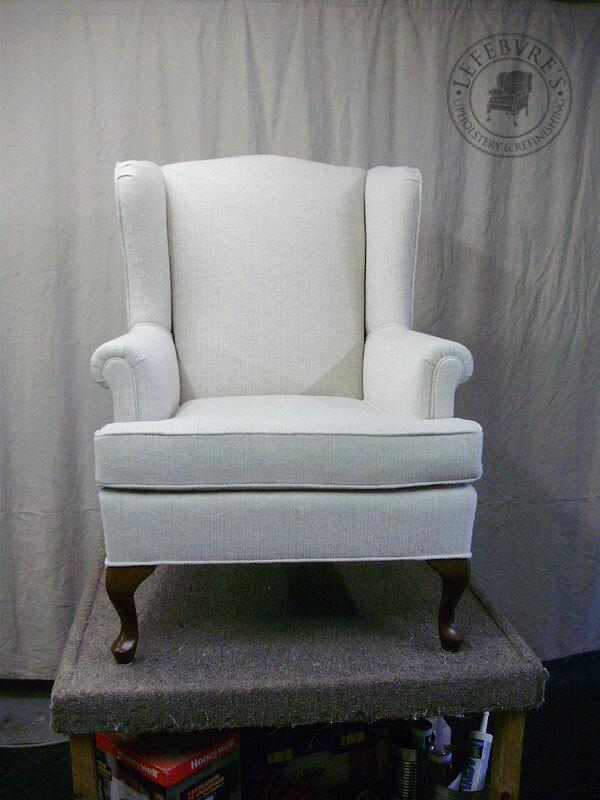 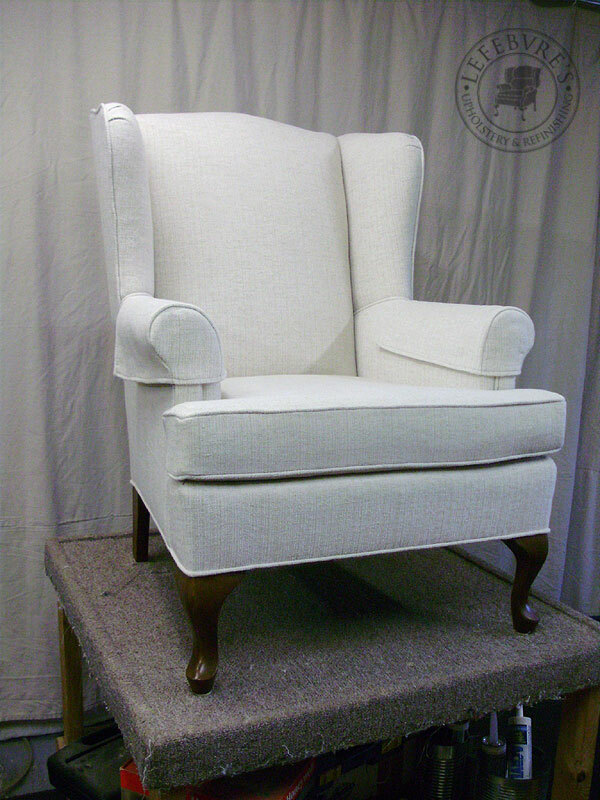 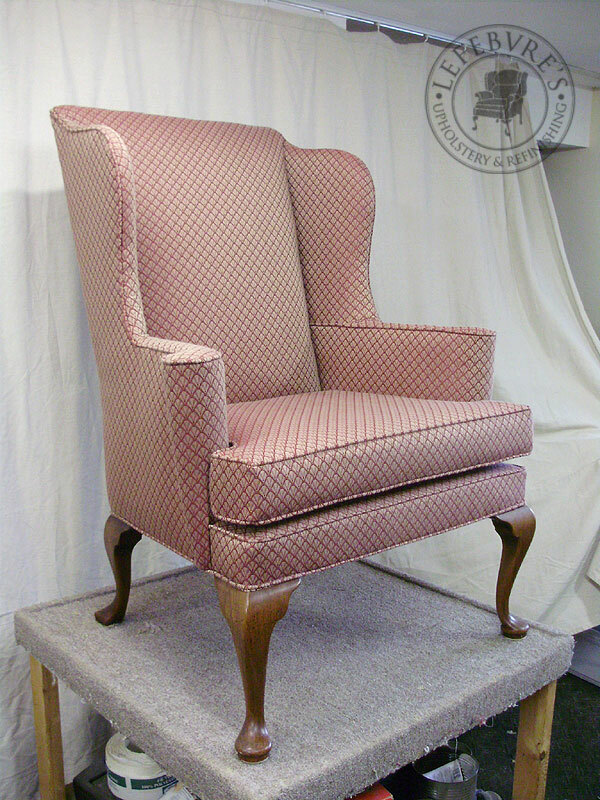 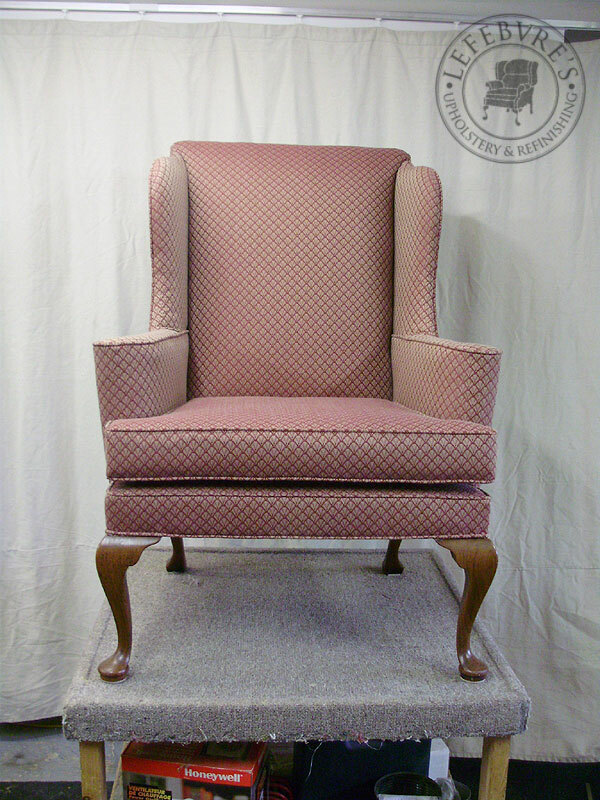 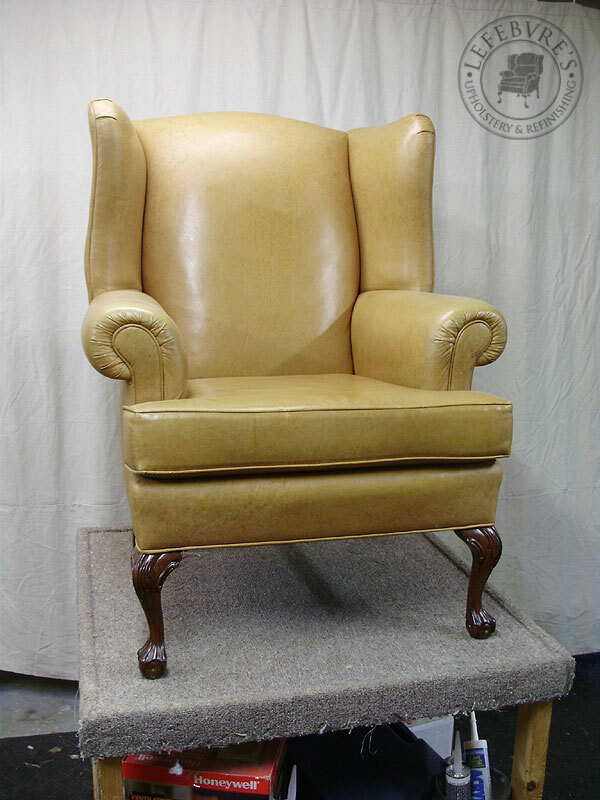 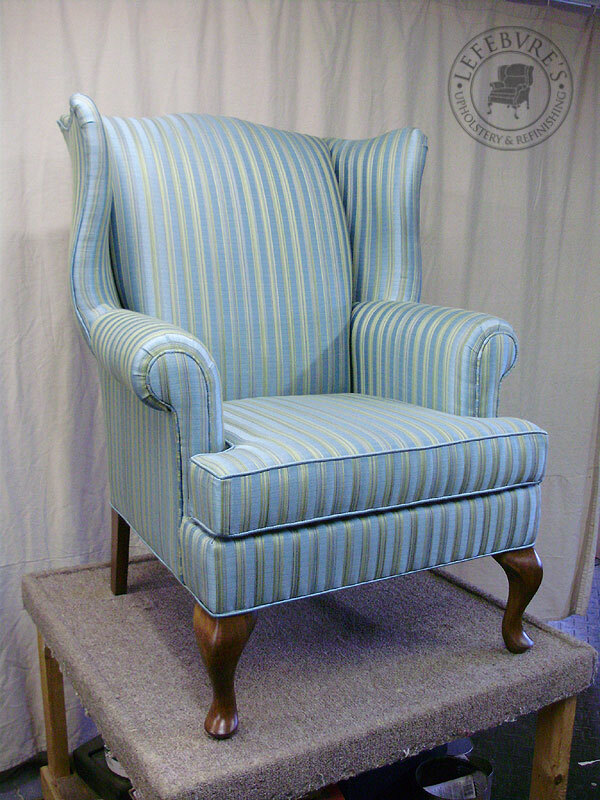 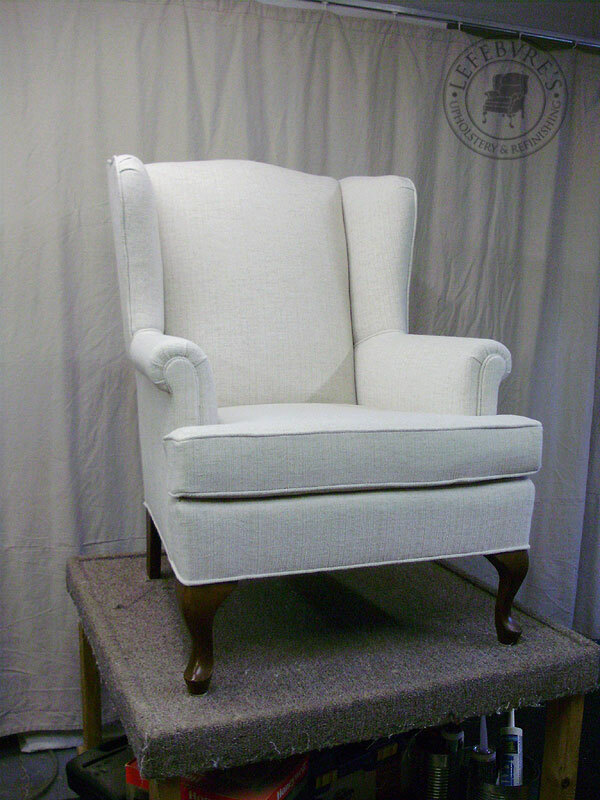 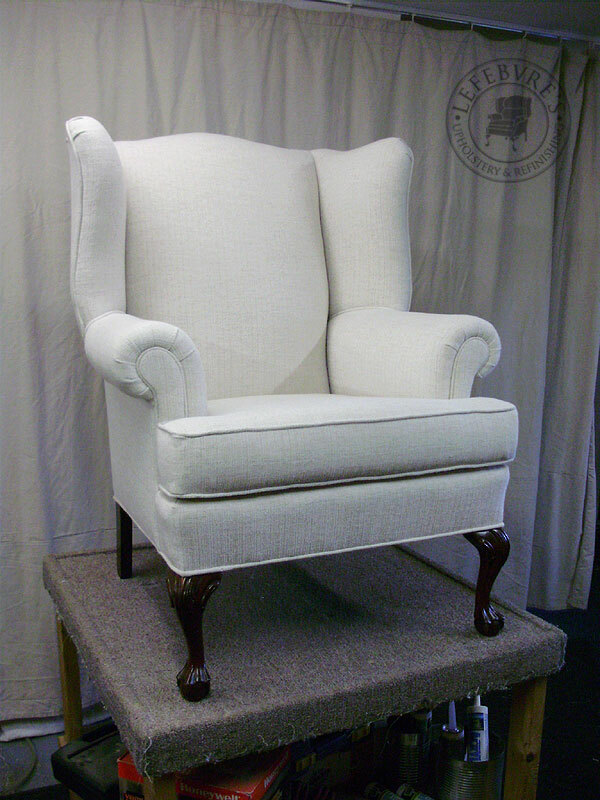 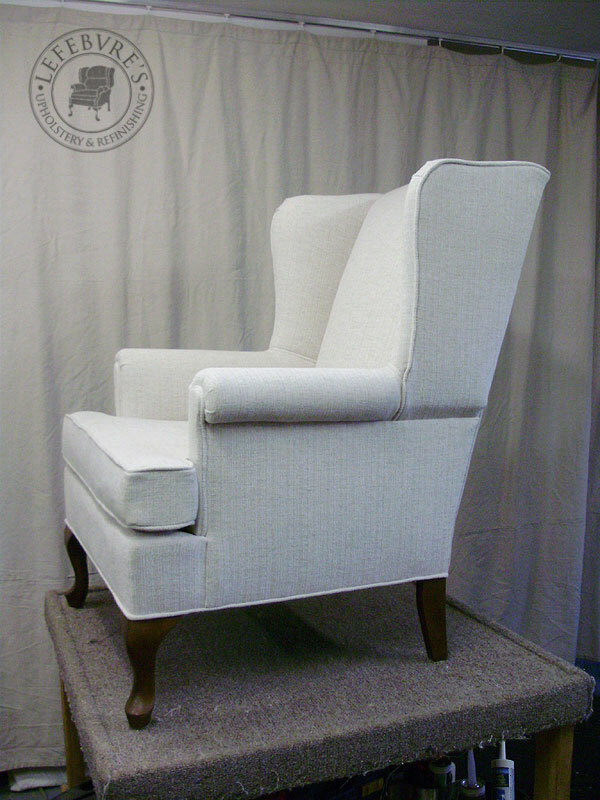 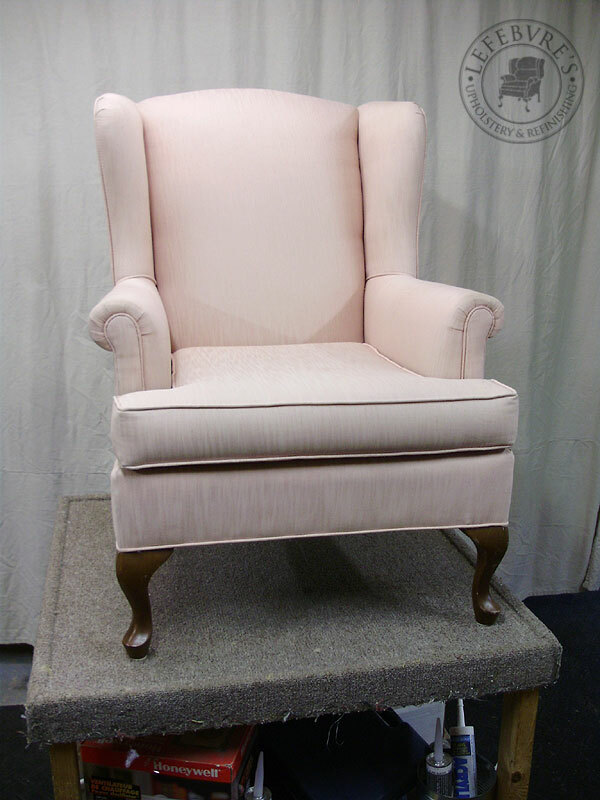 Old wing chairs typically have tall backs, rolled (cone/barrel/scroll) front arms, and thin bottoms (no springs, just stretched webbing, a bit of padding, and a feather pillow). 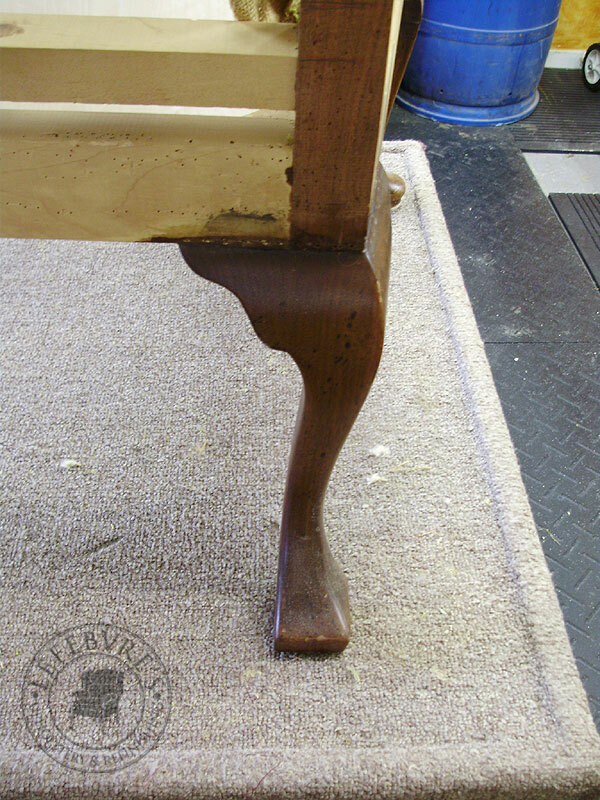 In the style of older (and better quality) chairs, this wing has carved rear legs. 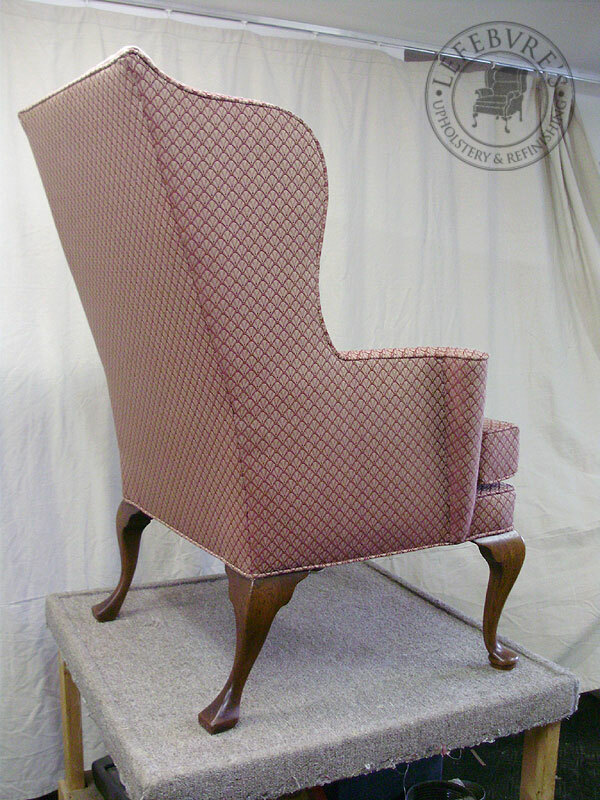 The vast majority of chairs (of any style) will only have fancy front legs, since the back legs rarely show. 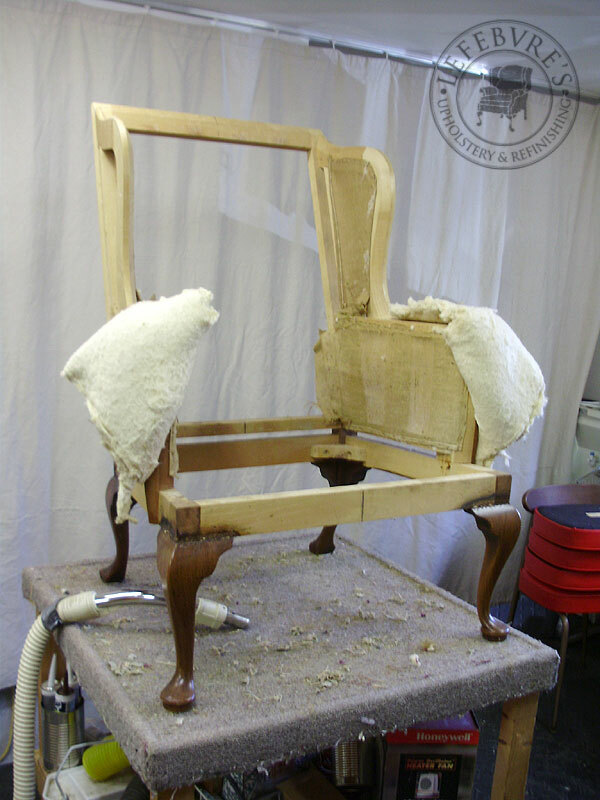 This chair was so nice that Pierre and I took down detailed notes, measurements, and construction information on the chair. 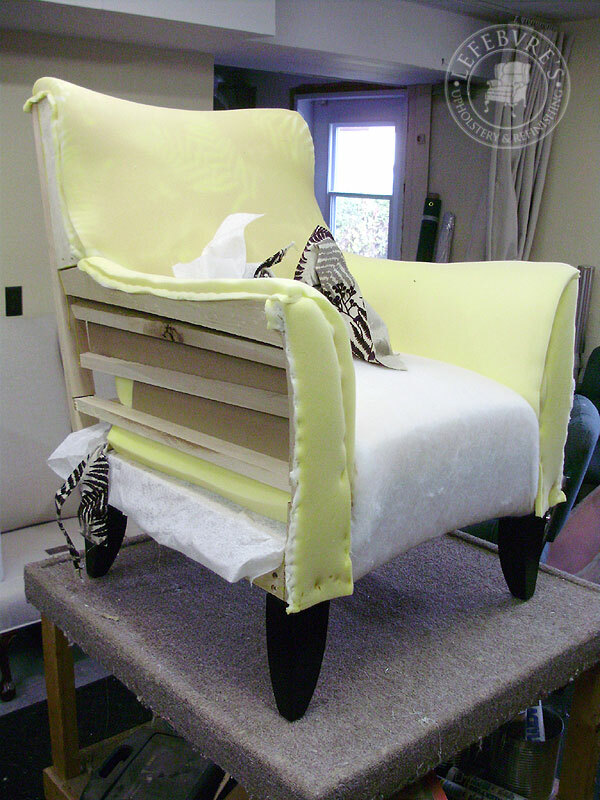 This was a chair that Pierre was working on while I was away, so I don't have proper before photos. 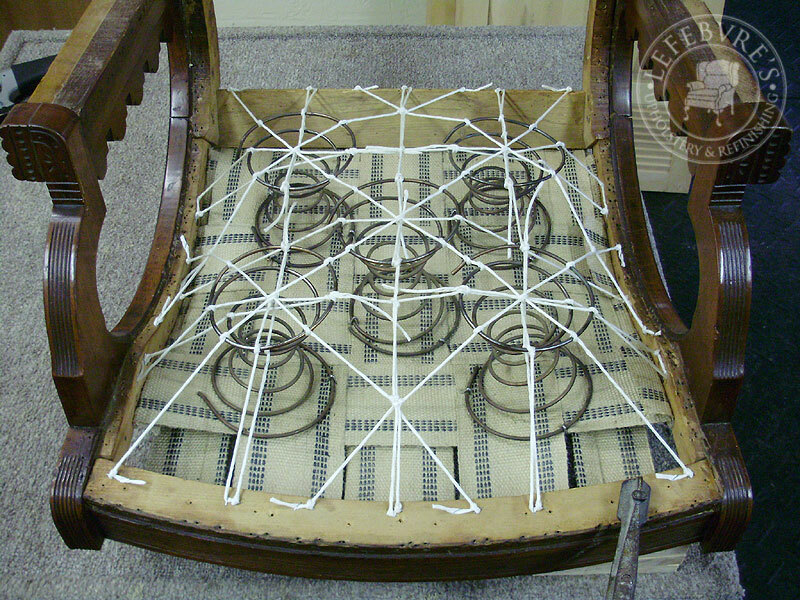 The webbing on the chair was the plastic kind (suggesting it may be a European piece). 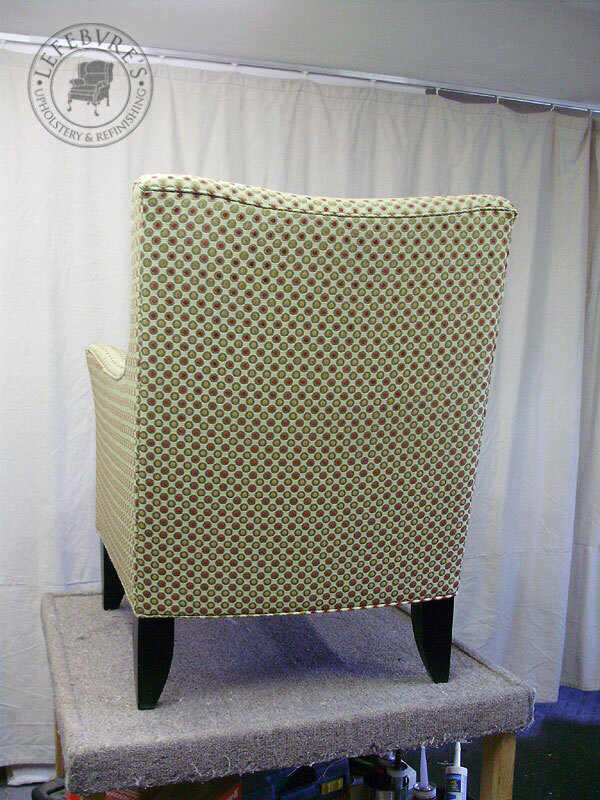 I can't recall what the previous fabric looked like. 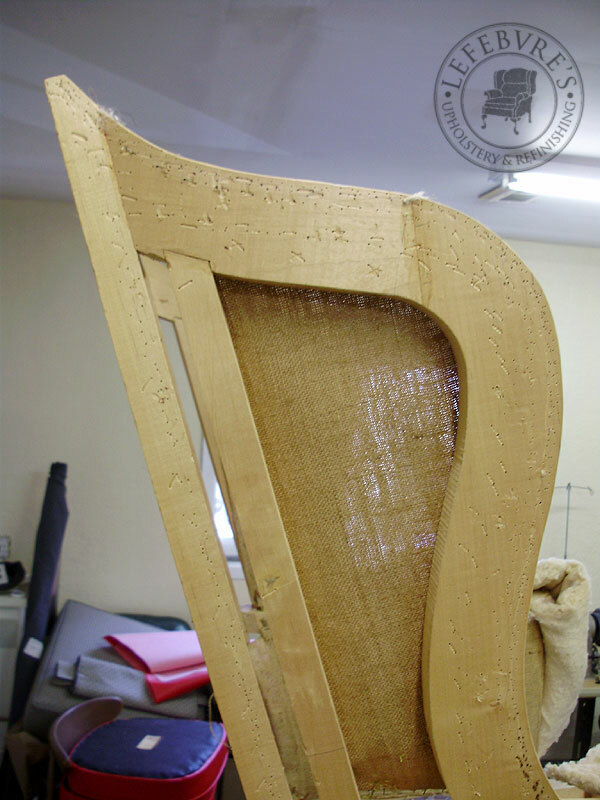 Look at the tight, precise joinery (notched and angled wing board).